Rescuers and journalists evacuate an injured man from the scene where explosions and gunshots were heard at the Dusit hotel compound, in Nairobi, Kenya, Jan. 15, 2019. KENYA: Kenyan President Uhuru Kenyatta said all the gunmen behind Nairobi hotel complex attack have been killed and the 19-hour hostage crisis is over. In a national television address, Kenyatta said on Wednesday 14 civilians died in the attack claimed by the al-Shabab armed group. The President said more than 700 civilians were evacuated from the complex. “The security operation operation at Dusit complex is over and all the terrorists have been eliminated,” said Kenyatta. Meanwhile, the Islamic extremist group al-Shabab is claiming responsibility for Tuesday’s terrorist attack. Police say at least 14 people were killed and a still undetermined number wounded. The U.S. State Department has confirmed that one American was among the dead, but has not identified the victim. A British citizen was also reportedly killed in the attack. Kenya’s Interior Minister Fred Matiang’i says the country is safe and the situation under control. The attack on the DusitD2 complex began in mid-afternoon with an explosion outside a bank and a suicide bombing in the hotel lobby. Earlier, four gunmen could be seen on surveillance video walking through the parking lot with at least one stopping to open fire. Terrified office and hotel workers and guests ran for cover, streaming from the buildings, climbing out of windows, ducking behind police vehicles and anything they could find while gunfire echoed off the walls. Police found a sad and grisly scene inside one of the restaurants — wounded and dead diners at their tables, slumped over unfinished meals. Other witnesses say they found human limbs lying on the ground. “A loud explosion happened at the gate. Next there was shooting, an exchange of fire, a lot of fire, and we see people rushing and running around in every direction,” he said. He and his friends escaped by running down an alleyway. The DusitD2 hotel and shops are in an upscale Nairobi neighbourhood popular with American, European, and Indian tourists, although exactly who was targeted and why is unclear. 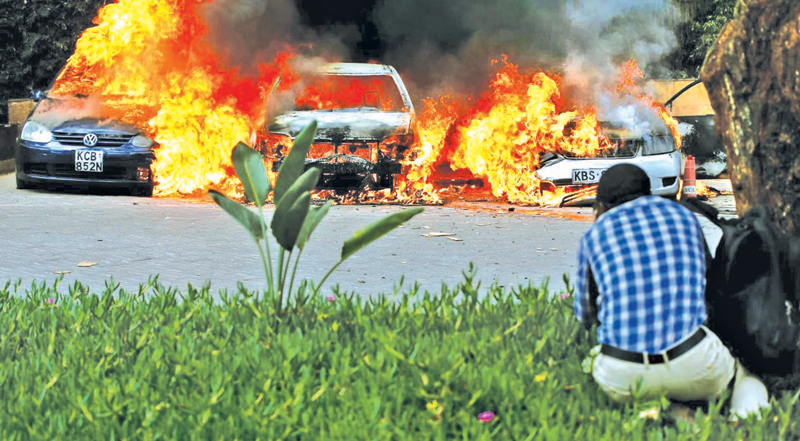 The militant Islamic Al-Shabab staged several previous attacks in Kenya, including the September 2013 assault on Nairobi’s Westgate Mall that left 67 dead. The militants targeted Kenya after Kenyan forces entered Somalia in 2011 with al-Shabab as their target.